Hewitt Homeschooling has been assisting families since the 60's. They are based out of Washougal, Washington and offer a wide selection of resources for children in grades kindergarten through high school. Their goal is to emphasize excellent academics with character development, by instilling a strong work ethic, and to develop a spirit of community service within the next generation. Their business is currently divided into three sectors: services, products and standardized testing. The majority of the Hewitt Homeschool curriculum is literature based and uses classic books and poems to teach writing skills and literacy analysis. 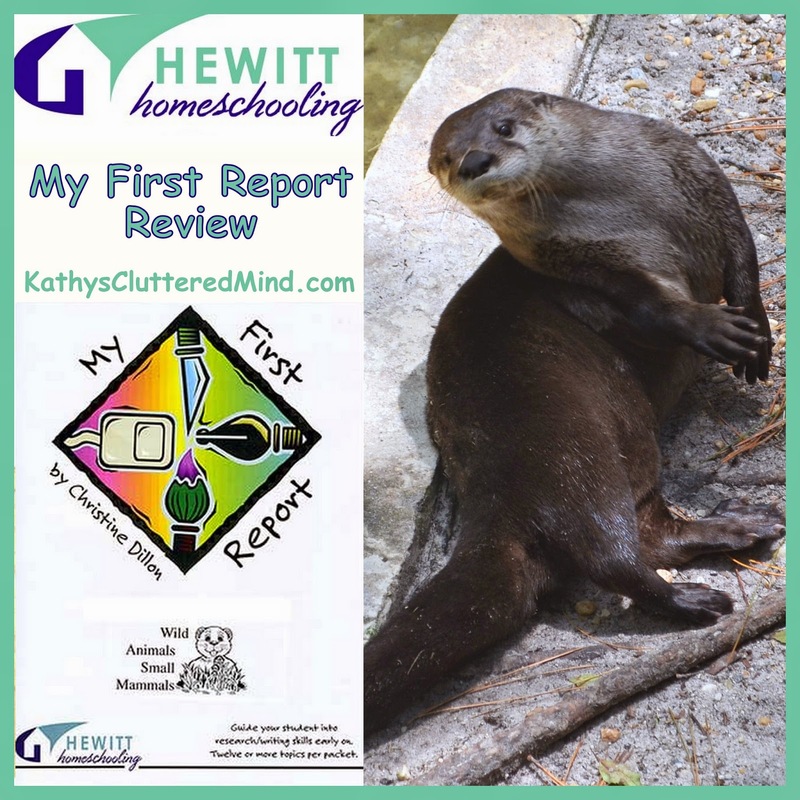 We love literature and unit studies so I knew that the My First Report's from Hewitt Homeschooling were going to be a huge hit. After much deliberation my animal loving 8 year old daughter choose the My First Report: Wild Animals: Small Mammals. My First Report was written with 3rd - 4th graders in mind but it can also be used with 1st - 2nd graders with parental direction. They can also be used for remedial use for children in 5th - 8th grade. My First Reports allows children to express their knowledge in complete written sentences rather than just filling in workbook pages with short answers. These simple, easy to use packets are great for inspiring young children to be creative in their writing while helping them develop skills in penmanship, vocabulary, reading and critical thinking. There are currently 24 different My First Report topics to choose from. Some of the others include: Music, Solar System, Weather, Lewis and Clark Expedition, Famous People and My State. Each My First Reports contains several questionnaire sheets. These sheets contain a few questions and vocabulary words to help direct children in their research. The Wild Animals: Small Mammals contained questionnaires on Beavers, Foxes, Skunks, Opossums, Koalas, Raccoons, Otters, Porcupines, Squirrels, Pandas, Moles, Bats and Armadillos. If you use one topic per week, a packet will take you an entire quarter to complete. In the back of each packet are 3 sets of blank reproducible report masters. Each includes one plain sheet with ruled lines and one with a space for a drawing or cut-out picture to illustrate the report. 3 different line sizes are provided 5/8", 1/2" and 3/8" for each. In addition there is a unit study guide in the back of the packet which provides activity suggests for each subject including: art, music, language, reading, math, social studies/history, science/health, P.E, Bible and our favorite field trips. There is also a list of additional resources as well. My First Reports were the perfect fit for our unschool family. Since there are a variety of topics Gwyn was able to choose one that interested her most. Before we started we visited the library and checked out books on each of the mammals in the packet. I put the packet into a binder to keep it organized. Any activities she did also went into the binder. Gwyn decided she wanted to use a composition book for her writing rather than the lined worksheets. Each week I would let Gwyn choose an animal of her choice to work on throughout the week. After reading the simple, easy to understand, open-ended questions she would spend a day researching the animal by using books and the internet. On the 2nd day she would complete her report. This took her quite a while since she is not a fan of writing. On the third day we would do a few of the recommended unit study activities. Even though she doesn't like handwriting Gwyn loved My First Reports. She recently asked if she could type her reports instead on her blog, so that is probably how we will continue to utilize the writing portion. My First Reports made Summer learning fun and engaging. Gwyn is an emerging reader so she loved reading the questions and vocabulary words on the questionnaires. This was great for building her vocabulary and spelling words as well as her self confidence. My First Reports is very flexible and can be easily adjusted to fit your child's abilities and learning style. For example younger non-writers can dictate answers to their parents to write down. Children who don't like to write can provide short written answers. And older children or children who enjoy writing can provide complete written sentences and/or paragraphs. Since there is no set guide you must follow you can work through the packet as quickly or as slowly as you would like expanding on what interests your child the most. The included activities in the unit study are great for all learning styles and are fun and engaging. Due to some traveling this summer we are still working through the packet. We actually took it with us on our most recent adventure because I knew we would be experiencing lots of animals along the way. I grabbed the binder and a few books and we continued the learning on the road. We got to experience several of the animals from our packet up close which really reinforced all of Gwyn's research and report writing. Did you see the otter in the top photo? We saw him at Okefenokee Swamp Park. 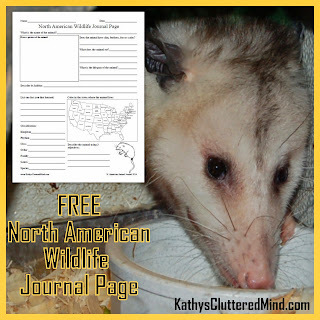 These 2 FREE journal pages I made went along great with this unit study too: Zoo Animal Journal Page and North American Wildlife Journal Page. I really liked the report packet. I learned a lot about animals and had lots of fun doing the activities. We saw lots of the animals on our trip. I don't like to write but the writing was really not that bad. I could read the questions on my own and could find the answers on my own too by reading books. My First Reports are approximately 50 – 70 pages and contain reproducible lined report masters. The 8 1/2 x 11 sheets are not bound, stapled or hole punched so you can choose how to store. My First Reports packets are very affordable and cost just $8.95. 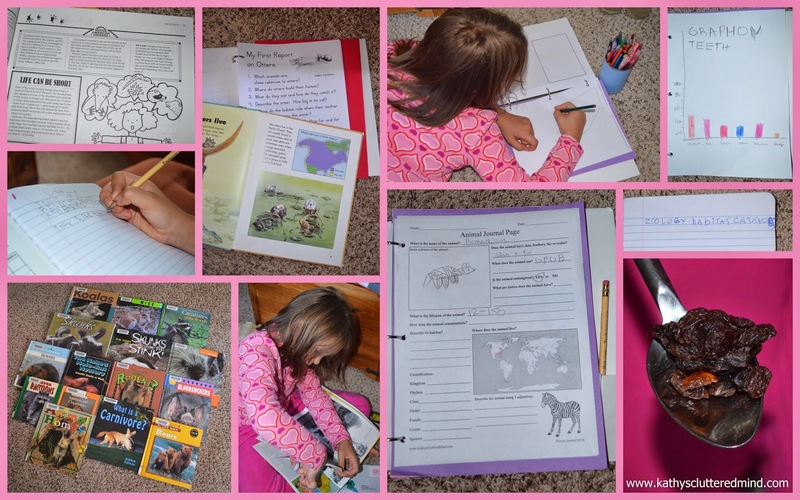 Click here for more Hewitt Homeschooling reviews (many different products were reviewed) from the The Schoolhouse Review Crew.